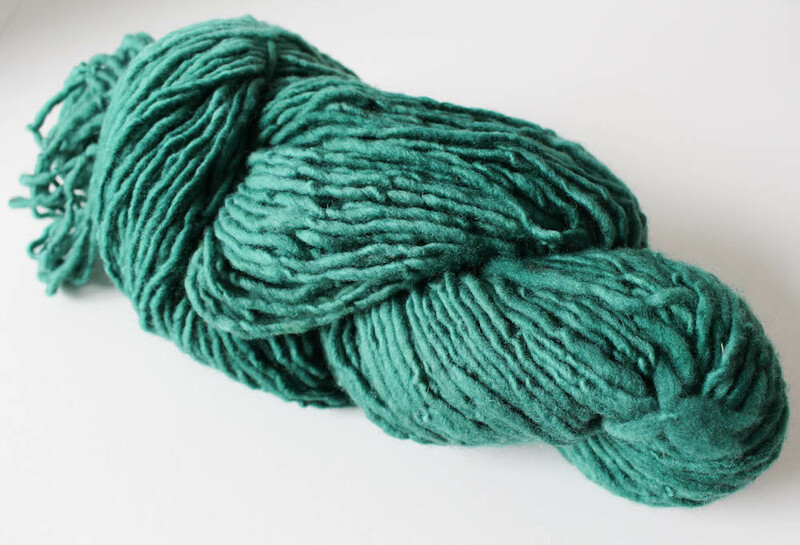 I’m Marie Segares from Underground Crafter, and I love to play around with new and exciting yarns. In the last few years, the availability of independent yarns has exploded. Every crocheter now has more access to hand-dyed yarns, handspun yarns, and yarns imported in small batches than ever before. 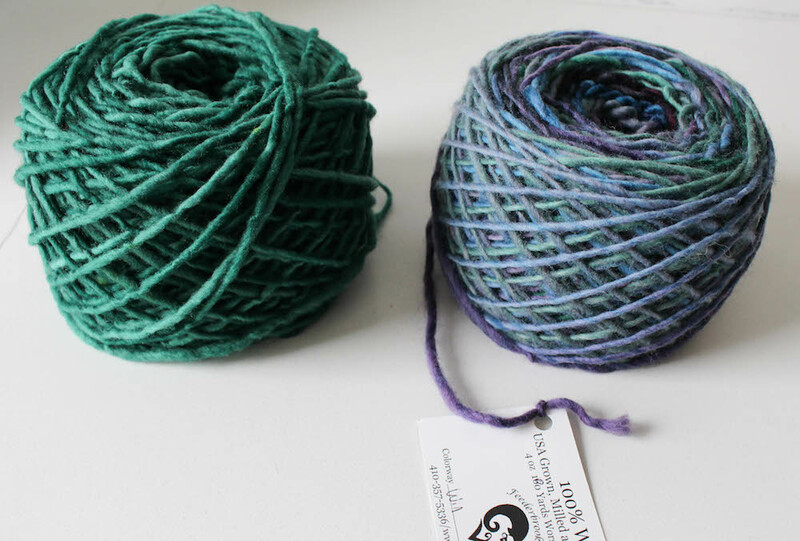 One thing that crocheters may find intimidating about buying yarn from independent companies is that it often comes in a hank and isn’t wound into a ball or a cake. When working on any crochet project, many crocheters agree that winding your yarn into a ball or a cake is much easier than working from a hank of yarn. The reason is that by working from a yarn cake, your yarn won’t get tangled easily. Winding yarn also lets you pull your working yarn from the center, which many crocheters say is a much more smooth way to work. 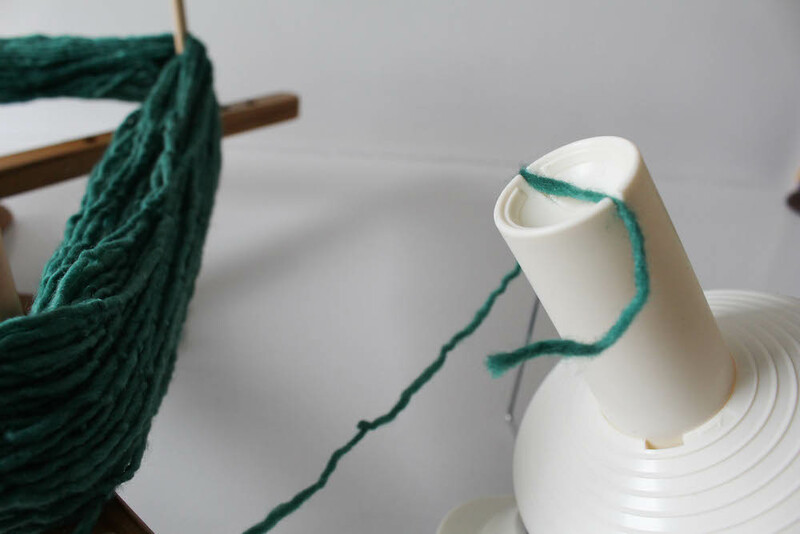 In this tutorial, I’m going to show you how to wind yarn into a cake using a yarn swift and a yarn winder. 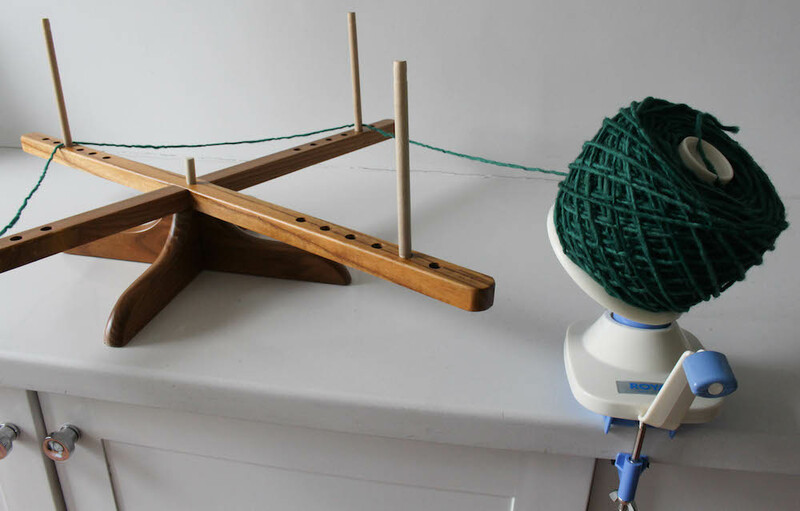 Start with a yarn swift (at left) and a ball winder (at right). I use an “Amish-style” yarn swift. It’s made of wood and can be easily assembled and then put away just as quickly (which is perfect for apartment living). 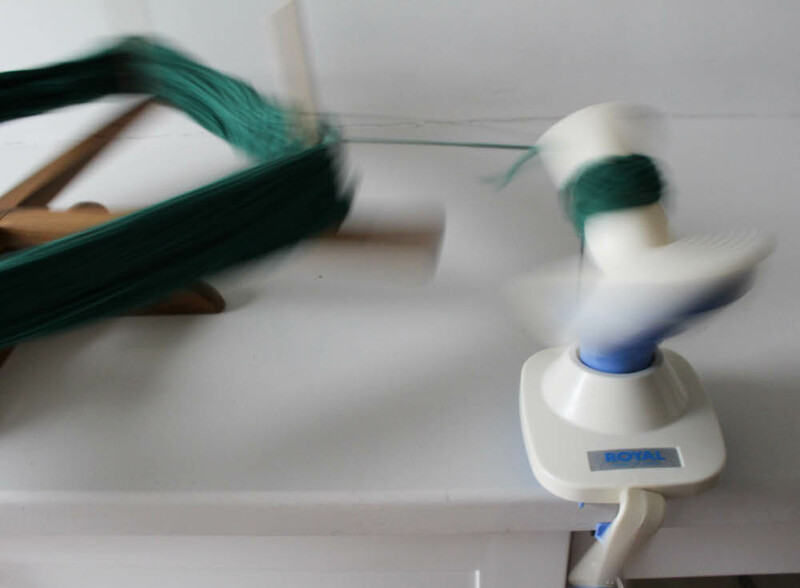 Follow the instructions for assembling your swift and winder, and set them up close near each other on a flat surface.I use a hand-cranked ball winder. It’s much quieter (and smaller) than the electric versions, and I can control the tension and speed that I’m using to wind the yarn. 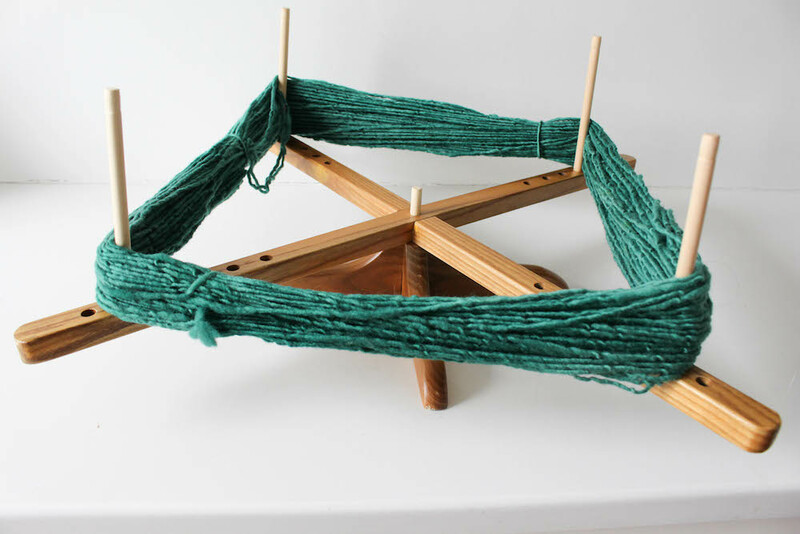 Be sure that it is tightly clamped onto the surface you are using to wind the yarn. 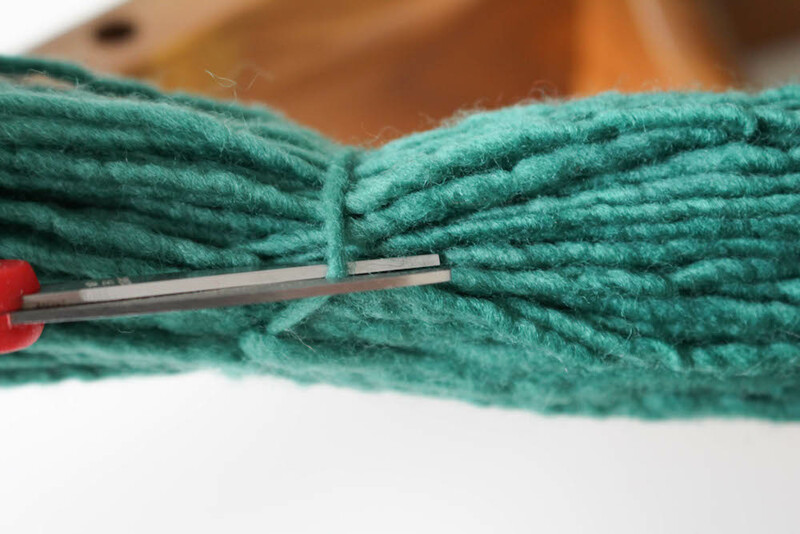 Look over the yarn once more, and adjust it if necessary so that there aren’t any twists in it. 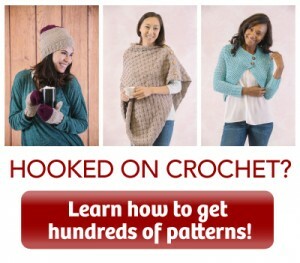 Start cranking your yarn winder clockwise. Don’t forget that your “yarn cakes” can pull from the center. The flat bottom makes the “yarn cake” easier to use than a ball of yarn. It sits flat and you don’t have to worry about it rolling away. 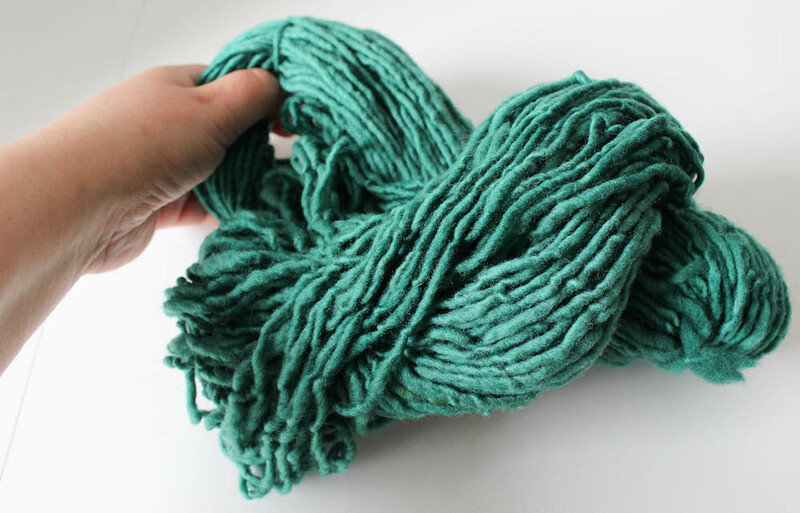 Now that you know how to wind your own yarn, go shopping for some indie yarn! You can find lots of options in local yarn shops, at regional fiber festivals, or through online marketplaces. 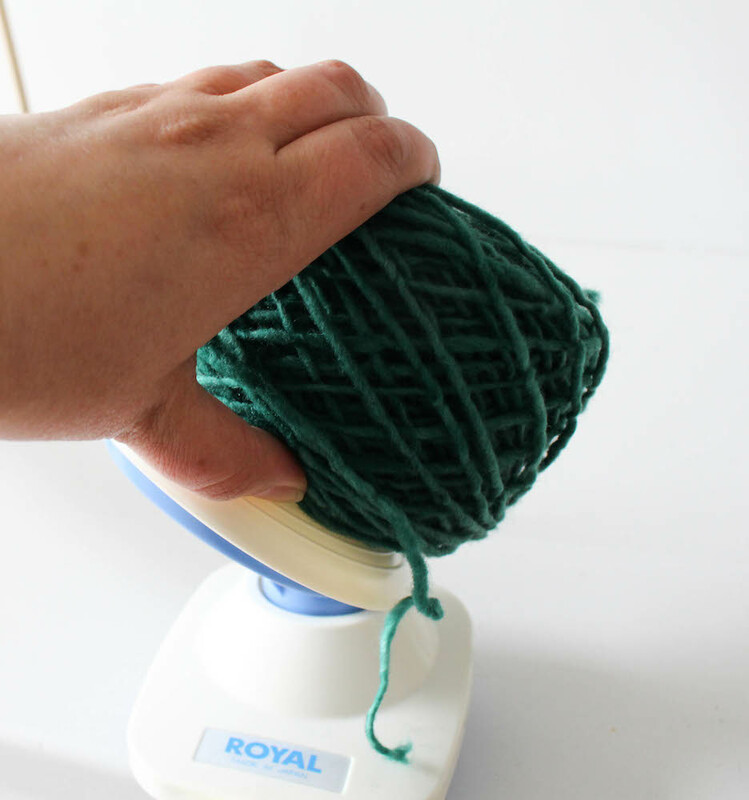 I have a winder (because I travel with my projects all the time and find tangled yarn exceptionally irritating, I re-wind balls into cakes – much better! ), but I can’t re-wind a whole ball because it’s rather small. Any ideas where I can find a larger one for a reasonable price? Check on Amazon, they have a jumbo ball/cake winder. It works great! Great tutorial. I knew how to do it but never knew the correct names for the things; hank/was bundle; swift/ was rack; cake /was ball. I have tried all of the methods mentioned and all work well. I use the yarn winder. 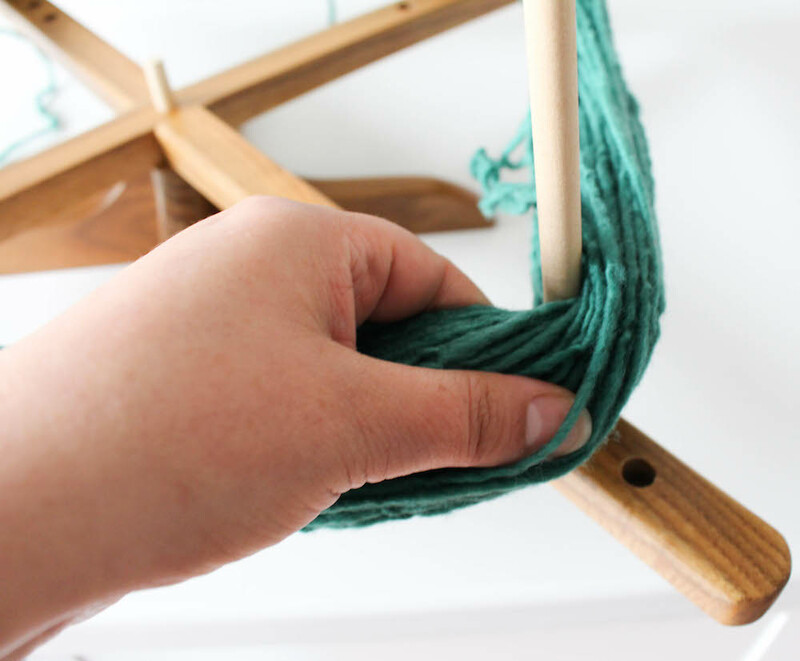 If I have an extra large hank of yarn, it is too much for the winder and starts winding underneath the holder and getting caught in the gear. Wish there was a larger holder for larger super sized yarn. Check eBay. 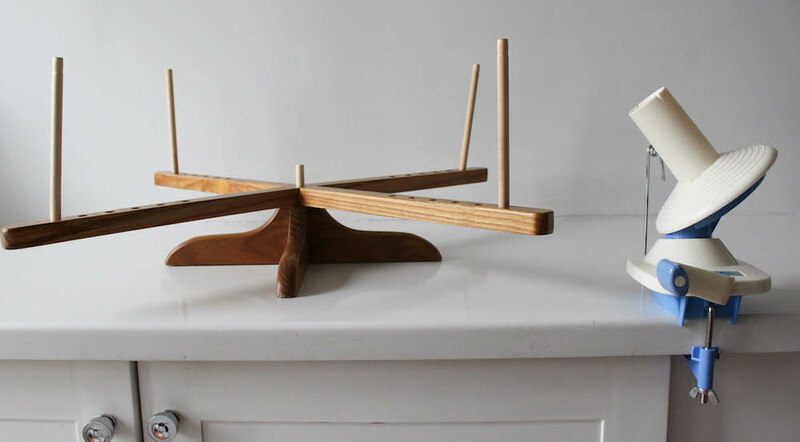 You can find some really nice yarn winders and swifts at really good prices much of the time. Been winding yarn as my grandmother taught me since I was about twelve. 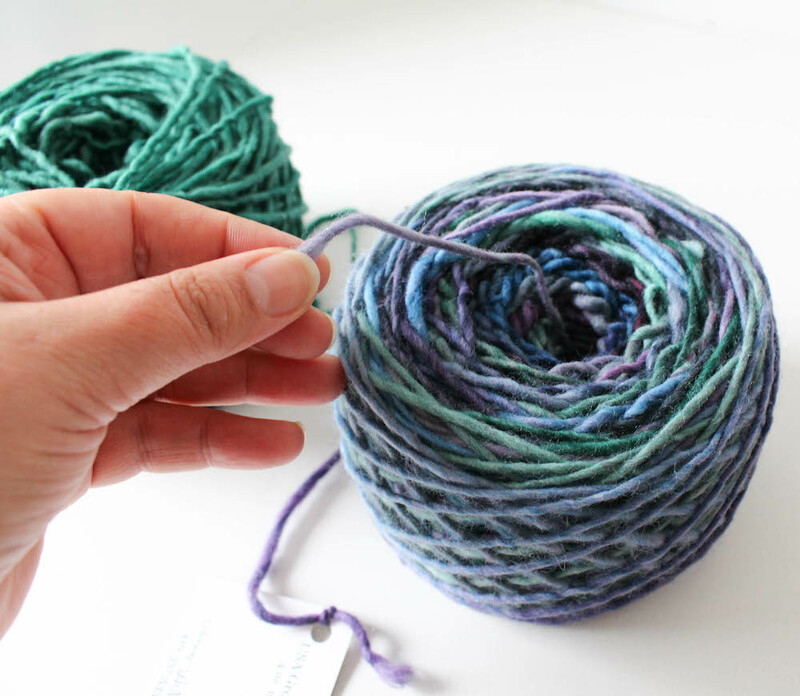 All you need is your Thumb and two fingers on one hand to wined the yarn around with the other hand. Allowing you to make the ball that can be pulled from the middle. No other tools necessary. If I get a hank I use my feet to hold it and wind in a ball with my hand, however, I do love the swift and and winder. Are they expensive and where do I find them? Thank you so much for the picture tutorial. I do the same thing as Ann, except I use the tube from an empty saran wrap box. It’s very sturdy, gives you something to grip onto as you’re winding and gives a slightly larger centre pull area (yarn’s not so tight when starting) Hey! It’s recycling at it’s finest! I don’t use any of these things to wind yarn. I just use a “STRAW”. of the ball. You have made a ball of yarn with the feed coming from the middle. (No ball rolling around the table or whatever). Your only investment is a common drinking straw that you probably have in your house. One thing…turn the ball you are winding every four or five turns to keep the ball even. 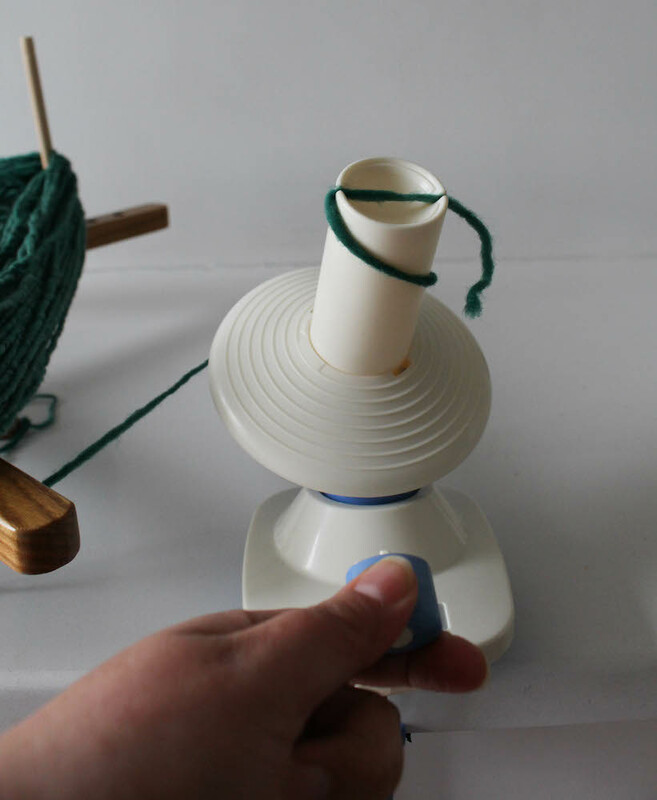 I love your yarn swift and ball winder pictorial. I don’t see where I can purchase these items anywhere on the site. I have crocheted for many years and have many yarns that need to be made into usable balls. Great tool! Please let me know how I can obtain these tools. Thank you. Thanks for this info. Definitely have this item on my wishlist. In the meantime, I use adjustable office chair with arms as swift and manually wind into a ball. Works great! Thank you! This is cool…will put on my wish list! Free Crochet Bag Patterns: 3 Everyday Bags You Need to Crochet Right Now!